This Epiphany materializes in the form of 11 heavenly (or hellish, depending upon your point of view) tracks. The divine entity, in this case, is Written In Ashes. Since I treasure every track on Epiphany, I will start at the beginning with "Shattered & Gone". Kevyn (vocals/guitar) tells me the female vocals in this song are provided by Lisa Stringfield from Carmina Piranha. This is the first time I have ever heard Written In Ashes use female vocals, so this was something unusual (and a nice surprise). One of my favorite tracks to hear Written In Ashes perform live is "(When I) Knew", a song which Kevyn always dedicates to his new son. Kevyn states, "(When I) Knew is all about Griffin, the whole experience of childbirth and being a new dad". I am thrilled that this song is included on Epiphany. Another of my favorite Epiphany tracks is "Sinners". This is also a very different track for Written In Ashes. Minimalistic in a sense (vocals, bass and keyboards), this song presents an eerie, almost religious experience for the listener. Sinners is different from anything I have heard before. I asked Kevyn about this track and he says, "The piano is actually Doc (guitar); and Mike (bass) is playing standup bass. The song was originally done on guitars, key, electric bass and drums, but it just didn't sound right. So, by chance, one day in the studio Mike and Doc were doing overdubs for some unrelated tracks, and just happened to listen back to the Sinners basic track. Marc Blewett, our sound guy who engineered the entire album, told them to come up with something else, and it kinda' just all came together." "Inauspicious" is another favorite tune, and this mix is one of the many variations of this song that I have been fortunate to have heard. This is a song that will always bring me to the dance floor when performed live. Another nice addition to Epiphany. The track "See The Truth" triggered a thought in my mind, and I was trying to figure out where I had heard some of the lyrics from that track before. I finally realized they were from "When The Sun Is Low " (from the first Written In Ashes CD, "Eternal"). I wanted to know how this came about. Kevyn says, "When the Sun is Low was a song about pure dark and dirty lust... See the Truth is more or less a reprieve from lust to love to longing and loss." The way Kevyn sings these 2, very different songs, seems to reflect those feelings. "When The Sun Is Low" is full of dark hunger, while "See The Truth" sounds sentimental and beautiful. I asked Kevyn a bit about the writing process that went into this cd. He tells me that they write everything as a band. "Members bring ideas like guitar riffs, keyboard lines, or lyrics to rehearsal. We work on it for awhile, sometimes a couple of weeks, until we decide if it has the potential to become an actual song... However, its not uncommon for someone to bring an entire song, and let the rest of the band fill in their parts. We usually never tell anyone to play a certain way, or play a certain part, we leave it up to one another to bring their own influences and personalities to the song". The final track on Epiphany is "Terrapin". This song seems to reach me somewhere deep from my past. When I listen to Terrapin, I can visualize the night sea, foaming and black with moonlight tracing patterns in silver on the water.... I can smell the salt air, and feel it in my hair. I wanted to know more about this extremely powerful song. Kevyn states, "Mike came up with the initial riff". He adds, "It had been quite awhile since we'd written an epic type of a song. When we started working on the piece, it really began to feel right. We were trying to capture that essence of displacement, so when you closed your eyes, the song would whisk you away to some far off dream". That is exactly the effect that this song has on me. I find myself going back to this particular track time and time again, and I can get quite lost in the alluring darkness of this song. 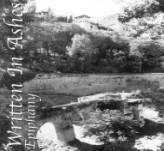 Check the WIA website (http://www.writteninashes.com) for information regarding the CD release party which is tentatively scheduled for April 23rd at Bar of the Gods..... "Epiphany" manifests on Easter Sunday at Bar of The Gods - how exquisitely appropriate.